R.A.M Environmental is a small client focused company working within the Industry and Education sectors. We are dedicated to offering a complete Dust and Fume Extraction service, working closely with customers through all stages of a project from initial conception through to design, manufacture, installation and LEV testing. Our LEV testing service is available for all types of Dust and Fume Extraction equipment regardless of the origin; this routine examination is carried out in accordance with the Health and Safety COSHH regulations 2002. We also carry out servicing and upgrades to existing equipment and supply spare parts including Dust Filters, Dust Seals, Flexible Hoses and Ductwork to name but a few. 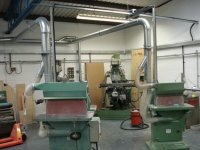 For further information on Dust extraction, Fume extraction and LEV testing,. Please feel free to browse our site or Contact Us, we look forward to discussing your requirements.